Not ready for confrontation with Trump: Putin's actions saw an interesting change. Senators of the United States demanded from Trump to impose sanctions against the detainees of the "Kremlin report". The United States stood on the side of Kyiv in the history of Hungary vetoing Ukraine-NATO Commission meeting. NATO advised Ukraine how to resolve the conflict with Hungary through the educational law. Putin "hurts" and unexpectedly canceled all public speeches. Anti-corruption court bill does not meet IMF program requirements - postman Lungman. The Armed Forces of Ukraine exceeds the Russian Army mentally - Pentagon. US Cybersecurity Advisers and Strategic Communications will arrive in Ukraine this year - US Defense. In Moldova, banned Russian propaganda on TV. The collapse of the An-148 in Moscow region: the important data on the indicators of the "black box" and the causes of the disaste. Banished From Ukraine, Saakashvili Vows To 'Break Necks' Of Kyiv Leaders. An attempt to get rid of me as a Ukrainian politician is doomed. I will restore citizenship, - Saakashvili. The plane on which Saakashvili allegedly was exported belongs to a businessman associated with Firtash. The publication of the "Kremlin list" of the United States revealed Russia's reluctance to go on to further confrontation with the United States. This was stated in an interview with "Apostrophe" by a Russian journalist and political scientist, a specialist in the recent history of Russia, a former employee of the Brookings Institution and the Carnegie Endowment for International Peace, Lilia Shvetsova. "But look at Putin's reaction to the Congress's actions, the law of Congress in August (Putin did not make any" rebound") to this" Kremlin list "(he said: well, we expect, we can answer, but we will not answer, we do not want to complicate the relationship)! Here he really is absolutely sincere: Moscow is not ready for confrontation with the West, until the confrontation with Trump,"- says the expert. According to her, Putin is now afraid of the foreign policy slogan of Trump America first, "America first of all", which means that the United States is not going to look back on Russia in foreign affairs. Also, Putin realizes that Russia will not pull the arms race from the US. "Therefore, now the policy of the Kremlin is not to annoy America, to try to reconcile with America, and it seems that this policy is a certain echo in the White House, since it's not for nothing at that moment when Americans published their so-called Kremlin report, in the United States suddenly there were three Russian leaders security forces, including the head of the Foreign Intelligence Service Serhiy Naryshkin, who is on the American list of sanctions, "Shvetsova said. Senators of the United States demanded from Trump to impose sanctions against the detainees of the "Kremlin report"
In the United States, three senator-democrats have prepared a resolution demanding the introduction of new sanctions against the "Kremlin Report" detainees. As informs Tsensor.NET with reference to Gazeta.ru, Politico reports. Senators of the US Congress, Ben Kardin, Sherrod Brown and Robert Menendez, urged US President Donald Trump to strengthen sanctions against the RF, made possible by the 2017 law. According to the publication, the Democrats are outraged by the fact that in January the Trump administration decided not to impose new sanctions on Russia. "The lack of seriousness manifested by the administration in the face of a clear threat to national security and even more conscientious congressional intentions is alarming and can not last," Cardin said. Recall that the "Kremlin Report" was promulgated on the morning of January 30th. Before the transfer to the US Congress, the list includes the names of 210 people, as evidenced by a document distributed by the US Department of the Interior. The Office issued only a fragment of the report - an unsecured part of it. A group of international experts has formulated the criteria for selecting "faces" of the forthcoming "Kremlin report", which, according to law No. 3364 "On counteraction to American adversaries by means of sanctions" (CAATSA), can await the freezing of financial assets and a ban on entry into the United States. 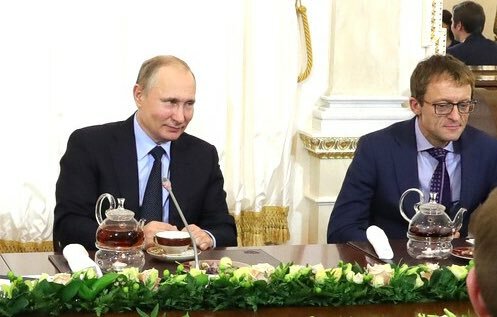 Article 241 of this law states that the report should consider the connections of these people with Vladimir Putin, establish their involvement in corruption, estimate the size of their wealth and source of income. One of the signs of "proximity to the regime," experts note, is the involvement (open or hidden) of "aggressive (and illegal) acts of the Putin regime." These include Russia's intervention in the 2016 US presidential election; "military aggression" in relation to Georgia and Ukraine, in particular the annexation of the Crimea; bombing civilians in Chechnya and Syria; the murder of Yuriy Shchekochikhin, Anna Politkovskaya, Alexander Litvinenko, Sergei Magnitsky, Boris Nemtsov and other opposition politicians, public activists, journalists, and lawyers. The United States supports the holding of a meeting of the NATO-Ukraine Commission at the level of heads of state and at the ministerial level, hoping to find a common solution between Ukraine and Hungary. This was stated by US Ambassador to NATO Kay Hutchison, according to Today . According to her, Washington supports the holding of a meeting of the Ukraine-NATO Commission. "We support the meeting of the Ukraine-NATO Commission at the level of heads of state and at the level of ministers," the ambassador said. She noted that the Ukraine-NATO Commission should not be canceled due to differences between Hungary and Ukraine. Earlier, Hungary blocked the Ukraine-NATO Commission (KUN) at the level of defense ministers, using the veto power. The decision of the conflict between Ukraine and Hungary on educational law may be contained in the Venice Commission's conclusions on this issue. This was stated by NATO Secretary General Jens Stoltenberg, Interfax-Ukraine reported . "I welcome the recommendations of the Venice Commission, I urge Ukraine to take a closer look at these recommendations, because there is a possible solution to this problem between Ukraine and Hungary," he said. Stoltenberg also noted that he intends to meet with President Poroshenko in Munich this week. -Recall that President Poroshenko signed the law "On Education" , which criticized Hungary and Romania through an article on education in the state language. -Hungary's Ministry of Foreign Affairs threatened to block all future rapprochement of Ukraine with the EU through the new law on education. -The Ministry of Foreign Affairs of Ukraine sent the Law "On Education" for examination to the Venice Commission and explained how the new educational law will extend the rights of minorities. -The Venice Commission did not support the criticisms of Hungary regarding the Ukrainian educational law. The EU agrees that the educational law does not violate the association agreement. -The Venice Commission concluded that the rights of the Hungarian-speaking and other minorities can be respected without amending the Art. 7 of the law on education - the one that establishes the language of instruction. -On February 9, Hungary applied veto power and blocked the NATO-Ukraine Commission meeting at the level of defense ministers. All public speeches by President Vladimir Putin were canceled due to his health. Press secretary Dmitry Peskov said that Russia's president was ill. The words of the spokesman for Twitter were handed over to Russian journalist Kremlin pool Dmitry Smirnov. Vladimir Putin canceled at least two closest public events. On Tuesday he had to hold a meeting on civilian microelectronics in the Kremlin. On Wednesday, Putin planned to take part in the forum "Mentor", which is being conducted by the Agency of Strategic Initiatives. Earlier, the president abolished business trips to Sochi. According to the Russian TV channel "Rain", some sources indicate that the change in Putin's plans may be due to the situation in Syria. As reported by the "Apostrophe", on the evening of February 12, telephone talks between US and Russian presidents Donald Trump and Vladimir Putin took place, during which they discussed the situation in Palestine and around the DPRK. The Presidential Bill on the Establishment of the Anticorruption Court does not meet the terms of the program of the International Monetary Fund. This was stated in an exclusive interview to "Gromadsky" by the head of the mission of the mission in Ukraine Yost Ljungman, informs Tsensor.NET. He noted that the creation of an independent Anticorruption Court is a key requirement for the next stage of the audit, which should determine whether Ukraine will receive another tranche from the IMF. "What really matters is the need to create an independent anti-corruption court, to recruit independent judges with impeccable reputation and to launch the work of this court without delays. As for the bill, there is a broad consensus (among international partners and donors) that the document in its current form does not provide the above results, it does not meet the requirements of the IMF program, as well as the recommendations of the Venice Commission. It is now necessary to step back and ensure the creation of legislation that will strengthen the successful fight against corruption. this among high-ranking officials, "said Ljungman. Among other requirements of the program, he calls rise in gas prices, privatization, pension, and land reform. In terms of mentality, the Russian army is weaker than the Armed Forces. This was stated in an interview by "112 Ukraine" senior US defense counsel from the United States, Steven Silverstein, informs Tsensor. NET. "In terms of mentality, Russia is much weaker, in terms of arms - much stronger. But in the long run, NATO standards and international standards and approaches will provide the formation of a highly manoeuvrable military force that will be easy to adapt and adapt. That is why Poland, the former Czechoslovakia, has evolved. East Germany - because of the change in the mentality of people and, in particular, of the military, it differs from Moscow, "said Silverstein. According to him, the military leadership in Ukraine is aimed at conducting "systematic and thought-out" reforms. "Putin has weapons and money, but Ukraine has the heart, the heart and the will of its citizens, which was heard loud and clear four years ago, but it takes time for people with a Soviet mentality to learn that there is not only a lemon, but what This is a very theoretical approach, but it pleases me that the Ukrainian military leadership and, in particular, Poltorak understand this theoretical component and, in particular, it develops the infrastructure to carry out these reforms systematically and well thought out", - said senior US defense counsel. Two other US advisers will arrive in the Ministry of Defense this year, said Foreign Minister of the United States Department of Defense Steven Silverstein. "We want to send advisers to cyber security and strategic communications in Ukraine. We carefully study the Defense Strategic Bulletin to see which sphere is not yet covered by an advisor... The cyber security specialist is urgently needed because of the high level of aggression that we are currently in the process of seeking such an advisor. It's a big investment in human resources, "said Silverstein in an interview with Interfax-Ukraine, Censor.NET reports. He said that recently a senior strategic advisor arrived in Ukraine from the United States, his task is to ensure coordination of the entire defense reform process. "Already there was a meeting with General Petrenko (Deputy Minister of Defense of Ukraine on European Integration, Lieutenant General Anatoly Petrenko - Ed. )", - said Silverstein. Answering the question of assistance in the form of weapons and military equipment, he said: "I would not want to talk about weapons, because I do not want to give additional information to my enemies. My heart is with Ukraine and I do not want to harm. But I'm sure the United States is very much appreciated. Ukraine as a partner, know the true history of Ukraine". "Minister Mettis declared that he believes in the efforts of Minister Poltorak," - added S. Silverstein. In Moldova, on February 12, a law banning national news channels from showing Russian news and information-analytical programs came into force. This is reported by Tsensor.NET with a link to NewsMaker. It is noted that the Coordination Council on Television and Radio of Moldova will monitor compliance with the new law. Thus, on February 12, a new broadcast network for channels has been approved on Moldovan television, which still broadcast Russian news. The Radio and Television Council will hold several unscheduled TV channel audits. Earlier, the law on the prohibition of Russian news programs was signed by Speaker of the Parliament of the Republic Andrian Kandu. He did it instead of the pro-Russian-minded Moldovan President Igor Dodon, who was temporarily suspended from office in early January. Dodon twice rejected the law on the fight against foreign propaganda, despite the fact that he was obliged to approve it in accordance with the constitution. The new law prohibits broadcasting in Moldova of information-analytical, military or political programs if they were made in countries that have not adopted the European Convention on Transfrontier Television. To such countries belongs Russia. Relaxation of entertainment programs or other programs from Russia is allowed. Violation of this restriction implies a revocation of a license for broadcasters. Specialists of the Interstate Aviation Committee (IAC) made their first conclusions about the An-148 catastrophe near Moscow, which happened on February 11. This is reported by Telegram-channel Mash. According to them, the accident could have occurred due to incorrect data on the speed of flight on the aircraft's displays, as well as icing the engine. "In simple terms, the plane was moving more slowly than the pilots assumed, and the units of the liner were still covered with ice, which killed 71 people," the report said. In addition, the MAC added that the indicators of the black "parametric" box say that the heating (used in bad weather conditions) was turned off. That is why the sensor showed the wrong speed. As specifies kommersant.ru, IAC specialists have records of 16 AN-148 flights, including the latest, which ended in a catastrophe. Mikheil Saakashvili has vowed to push ahead with his struggle against Ukraine's leadership in defiant remarks in Warsaw, a day after he was seized in Kyiv and banished to Poland in a dramatic expulsion he has blamed on President Petro Poroshenko. "We will break the necks of Poroshenko and [Prosecutor-General Yuriy] Lutsenko," Saakashvili said at a press conference on February 13. "They will go to prison -- not to Europe, to Ukrainian jails." Saakashvili, the former Georgian president who was hired by Poroshenko to head Ukraine's Odesa region but fell afoul of his friend over corruption and reforms, was detained at a Kyiv restaurant on February 12 and taken to the airport. He was flown to Poland, the country from which he returned to Ukraine in September 2017 -- eluding a border blockade -- after being stripped of his citizenship by Poroshenko in July. WATCH: CCTV cameras capture the dramatic scene as camouflaged men swoop into a Kyiv restaurant and detain Mikheil Saakashvili. The State Border Guard Service said he was removed from Ukraine on February 12 because he was in the country illegally. 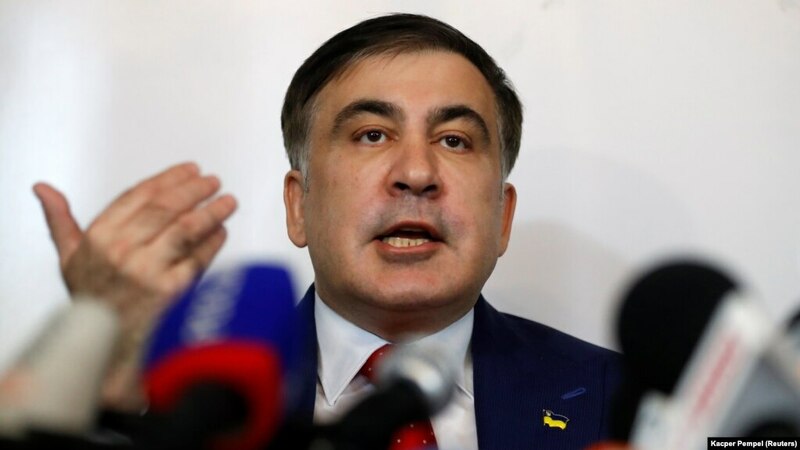 Ex-governor of the Odessa region of Ukraine Mikheil Saakashvili stated that he intends to resume Ukrainian citizenship. As Tsensor.NET informs with reference to the 112 "Ukraine" TV channel, he said during a press conference in Warsaw. "An attempt to get rid of me as a Ukrainian politician is doomed. I was, I remain a Ukrainian politician, as well as a Georgian, of course, but I will restore my Ukrainian citizenship," he said. He also promises to fight against Ukrainian oligarchs. "My neck fades, and we will twist the neck of the Ukrainian oligarch, I promise them," Saakashvili said. In his opinion, the President of Ukraine Petro Poroshenko is very afraid of his political person. Earlier, Saakashvili's compatriot David Sakvarearidze said that politicians detained people in camouflage uniforms in one of Kyiv's institutions. Later, the Speaker of the State Border Guard Service of Ukraine Oleg Slobodian said that the leader of the Movement of New Forces party, former Georgian President Mikheil Saakashvili returned to the country of his previous stay ( to Poland - Ed. ), During his detention in Kiev, Ukrainian border guards were forced to defend themselves and apply force support. Volodymyr Ariev, MP of the BPP, said that the plane on which Mihheil Saakashvili allegedly could be deported had nothing to do with President Poroshenko. As reported by Tsensor.NET, Ariev wrote about this on his Facebook page. "I wrote about the UR-USA plane two years ago and about who it belongs to, too, it has nothing to do with Poroshenko, from the word" absolutely. "It is necessary for colleagues to do elementary faktkeking before exaggerated frankness. PS It is definitely not known that this aircraft transported Saakashvili at all. PPS had no flights during the last two weeks, the proof on the screen in the comments, "says Ariev, and joins his post in May 2016, in which he writes, that earlier this aircraft was used by head of the radical party Oleg Lyashko. "...Let's add here the facts of flights Lyashko on a plane with aboard number UR-USA company IBE Trade Corp., which belongs to the businessman Rovt, which is associated with Firtash and with the former criminal pocket of Putin Severo Mogilevich" - said in the record Ar ' EVA for 2016. "I think the story with this aircraft is a fake," writes Ariev in his comments. The United States, on the occasion of the third anniversary of the signing of Minsk agreements, directly accused Moscow of non-fulfillment of its commitments and assured that sanctions against the Russian Federation would remain until full implementation of the agreements. This is stated in an official statement of the State Department of the United States, released on Tuesday, reports Tsensor. NET with reference to Ukrinform . "Unfortunately, Russia continues to neglect its obligations under the Minsk agreements, supporting a sharp conflict in Ukraine, which claimed the lives of more than 10 thousand people, including more than 2,500 civilians, and also forced 1.6 million Ukrainians leave their homes, "the document said. The State Department also noted that Moscow continues to deny its direct involvement in the conflict in the Donbas, although the Russian-led forces continue to intimidate the international observers of the SMM and block their access to the occupied territories. "Ukraine has passed legislation, in particular on amnesty regarding anti-government forces and special status for Donbass, which testifies to Ukraine's desire to implement the Minsk agreements," the US foreign ministry said. In this regard, the United States - in conjunction with France and Germany - called on the Russian government to stop the aggression in Ukraine. "Our sanctions will remain in force until Russia fully fulfills its obligations under the Minsk agreements. Our separate sanctions related to the Crimea will continue to operate until Russia returns the peninsula to Ukraine," the US Department of State said. Recall that February 12, 2018 was the third anniversary of the signing of the document entitled "Complex of measures aimed at the implementation of Minsk agreements", also known as "Minsk-2". On February 13, 2018, the detectives of NABU under the procedural guideline of the SAP prosecutors informed the Odesa mayor about suspicion of committing a criminal offense under Part 5 of Article 119 of the Criminal Code of Ukraine (Assignment, embezzlement or seizure of property by abuse of office). This is Tsensor.NET reported in the press service of NABU. The report states: "The suspicious notification was made on behalf of the head of the SAP, Nazar Holodnitsky, who signed the above-mentioned procedural document, as well as three other officials of the city's mayor's office: the deputy mayor, the director of the communal property department and the chairman of the standing commission on communal property of the Odesa City Council Procedural action is committed in accordance with Article 278, Article 135 of the CPC of Ukraine (since the location of these persons is not yet established) within the framework of the investigation of criminal proceedings Annie into the seizure of the local budget of Odesa. At the moment, the necessary measures are being taken to establish the whereabouts of suspects and, in the absence of them, will be decided on the issue of their being wanted. In addition, on February 13, during the conduct of investigative actions in the same criminal proceedings in accordance with Art. Another 208 CCP detained three people (one official of the municipality of Odesa and two individuals - company directors). Another person - the appraiser - was informed about suspicion of committing a crime under Part 5 of Article 190, art. 365-2 of the Criminal Code of Ukraine. Note that resolutions on conducting searches of the abovementioned officers of the detectives of the NABU were received from December 18-19, 2017. However, already 19-20 December 2017, three officials of the municipality went abroad, and since then, under various prescriptions, they did not return, probably to hide from the investigation. In early January 2018, the head of the permanent commission of the city council went abroad. In the opinion of the investigation, all the abovementioned persons are involved in the scheme for damages to the local budget of Odessa. So, in September 2016, the Odessa City Council acquired a building that previously belonged to the integral property complex of the State Enterprise Krajan Plant for 185 million UAH. in a private structure that in early 2016 bought this complex at auction, organized by the liquidator of the state enterprise, for 11.5 million UAH. Obtained from the city authorities funds, the company-seller tried to list companies with signs of fictitiousness, whose head is currently in the ATO zone. However, the detectives of NABU and SAP prosecutors prevented this legalization attempt and secured the seizure on accounts of a private company selling the building. Since then, attempts have been made to withdraw arrests from accounts, including a sudden change in the price of the agreement in January 2018. In October-December 2017, one of the acting deputies of the Odesa Regional Council, who according to the investigation, is the beneficiary of the company-seller of the mentioned building, together with another person offered the employee of the National Bureau an unlawful benefit in the amount of 500 thousand dollars in exchange for the withdrawal arrest from company accounts. The deputy and his accomplice on January 12, 2018, the General Prosecutor's Office of Ukraine was notified of a suspicion of committing a crime under Part 3 of Art. 369 of the Criminal Code of Ukraine ("Proposition, promise or render unlawful benefit to an official"). Russia may hold cyber oppression against Ukraine with new instruments. This is stated in a written report by Director of the National Intelligence Agency of the United States, Den Coats, "Assessment of Global Threats by US Intelligence Services," which he provided to the Senate Committee on Intelligence, where a hearing took place on February 13, - reports Radio Liberty. "We expect Russia to make more courageous and more devastating cyber-attacks the next year, and it is very likely to use new instruments against Ukraine," the document said. US intelligence expects Russia to try to attack critical US infrastructure. "Next year, Russian intelligence and security services will continue to attack the critical infrastructure of the United States and its allies, and will try to get closed information about the US policy on computer networks of the United States and NATO," explains intelligence. In reports of the CIA it was said that the cyberattack of the NotPetya virus in the summer of 2017 was most likely the Russian main intelligence department of the Ministry of Defense of Russia. The attack on the NotPetya virus began on June 27, 2017. In Ukraine, ministries, banks, transport companies, mobile operators, energy companies and mass media became victims. Earlier it was reported that the information system of the International Airport "Odessa" suffered a hacker attack . The SBU warned of a new large-scale cyberattack. Recall that on June 27, a computer virus-defector attacked Ukrainian banks , state and private companies, the media, and government agencies. The virus also hit computers in Europe and the United States. Kurt Volker, Special Representative of the United States Department of the Domestic Affairs of Ukraine, stressed the need for Russia to be elected by peace. Volker wrote about this on Twitter. "Yesterday (February 12th - ed.) There was an anniversary since the signing of the Minsk treaties - three years later, the war is still in full swing. The United States is ready to help end the hostilities, but Russia must choose peace, "said Volker. Earlier it was reported that the UN should consider the involvement of 20,000 non-NATO peacekeepers and 4,000 other policemen to help resolve the conflict in the Donbas. Special Representative US Volker: I do not believe that Russia has decided to withdraw troops from Donbas. The threat of the Russian offensive from the annexed Crimea remains today. The secretary of the National Security and Defense Council of Ukraine said in an exclusive interview to the Civic Society. "They concentrated on the occupied Crimean territory a very powerful military potential and it is not needed exclusively for defense," he said. According to Turchinov, on the territory of the Crimea, there are powerful offensive means, strategic aviation, rocket systems, which, in particular, can carry and use nuclear weapons. "This is a serious danger. Of course, such a concentration of troops is not needed for defense only. Therefore, we analyze the situation, including we see danger not only in the north and east, but also in the south - this is also a fact. Accordingly, we must be able and ready to resist in all directions: from south to north, "added the NSDC secretary. For deterrence of Russian aggression in Europe, the administration of US President Donald Trump will need $6.5 billion for the next fiscal year (from October). It is reported that the claimed amount is1.7 billion more than this year. According to a document published on Monday, February 12, in the fiscal year 2017, the Pentagon received $3.4 billion, and this year it invited $4.8 billion. A Defense Ministry spokeswoman said that in 2019, it is planned to spend more on weapons and ammunition, the improvement of Bradley tanks and combat vehicles, and on increasing the number presence in Europe on a rotational basis. Interestingly, the contingent's presence, according to the document, will be episodic and not always predictable. At the same time, funding for contingent increases is planned only in 2020. At the same time, according to Davis Welch, deputy director of the Army's budget management, the 2019 draft budget envisages financing of the European containment initiative and some other budgetary expenditures, such as the purchase of equipment and weapons systems. In particular, the technical equipment includes 40 Abrams tanks worth $455 million, 66 multipurpose armored vehicles ($230 million), 61 Bradley warheads ($205 million), and missiles for high-power missile artillery systems HMARS ($171 million). As reported by the "Apostrophe", the US plans to allocate about $214 million for the repair and construction of military structures at the bases of the Air Forces in Europe as part of the initiative to counter aggression by Russia.